There’s no way I could possibly share with you the full range of emotions we experienced, nor the depth and intensity of the spiritual forces that overtook us at every moment. There’s no way to share with you the transformation we’ve undergone in our outlook and our understanding. Every atom of my body wants to sing out in praise and I feel like my soul is blazing out with oceans of light. In the weeks to come, I will try to share with you glimpses of our experience as guests of Bahá’u’lláh in the Holy Land, but be warned that my tongue and my pen will necessarily fall short of conveying the full grandeur, glory and beauty of the experience. 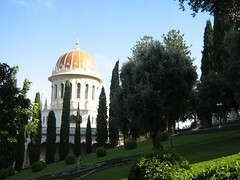 This entry was posted in baha'i blog, journal and tagged pilgrimage by danger. Bookmark the permalink. hi Dan! Looking foward to your posts. I must say i’m trying to write up my blog but it sure isn’t easy. It is almsot impossible to write about something so amazing.